A: "Very good question Jim! A small rectification regarding my camera. The Fuji x100s actually has a fixed 23mm lens, which is the equivalent to a 35mm. It's not only a fixed focal length, but also a non-detachable lens. And that is the reason why I bought it and claim that it is the best camera I've ever owned. The focal length is ideal for street photography. Why would I need to change it? Also, I can shoot anything else with that camera (I took it to Iceland even!) I embrace the limitations, they make me a better photographer. What else is in my camera bag? Batteries! The one small problem with the x100s is its really short battery life. I carry two extras with me at all times. I never use a flash, for anything. When I carry my ThinkTank Retrospective 5, my camera is never in it. It's in my hand, finger on the trigger. I still often bring the bag for a full day photo walk and I use it to carry personal items such as a water bottle, a snack and the tiniest travel umbrella. I'm definitely a gear minimalist and I strongly believe in the power of limitations. Although when you're lucky enough to shoot with a fine piece of gear like the Fuji x100s, I would hardly qualify it as limiting... It is, after all, the best camera I've ever owned. Not because it is technologically better, but because it has become an extension of me and my vision and it doesn't get in the way. If you found this post useful, please leave a comment below and share your experience with the community. If you have a question, feel free to send it to Valerie for an upcoming Q&A blog post. This blog cannot exist without your questions! Q: "I have an old Canon EOS Rebel Xs Film Camera with a 28-80mm 3.5-5.6 EF lens and a 75-300mm zoom II 4-5.6 lens. Is there still a market out there for this type of equipment? I'd like to sell it and buy a lens for my DSLR instead. A: "Hi Nicki! Thank you for your question. Used camera bodies sell but they don't sell for much. Especially entry level cameras that were inexpensive to start with. Unless you can get an accurate shutter actuation count to show that it still has a lot of life left, most people will not buy used camera bodies. Lenses, on the other end, do sell if they have been well taken care of. The only thing that would be a deal breaker is mold in the lens which is a fairly common problem that cannot be fixed. That all depends where you live, but it is a real concern is some parts of the world where lenses need special storing precautions to stay dry. The lenses listed above are not expensive lenses to start with, so you won't get much for them. You may also consider donating them to a school or a non profit program like 100 Cameras. Question #34: About NX300 vs. X100S? Hi everyone! It's been a while since I've answered a question on my Q&A Blog. I have a few hours to catch up as I am sitting on the plane from MSP to SFO. Perfect time to answer another question! I'm not ready to scrap my Canon 70-200, but am thinking about a second camera for travel. I do have the x100s, but believe it would be somewhat limiting. Your thoughts would be appreciated.. Maybe this can be your question of the week." Hugh H.
The NX300 is small, light weight and has an appealing retro look. Its large tilt LCD is very convenient and the touch focus quite efficient. Its 20MP and WiFi connectivity make it quite appealing as well. I would not recommend the kit lens, I’ve used it almost exclusively with the 30mm f/2.0 pancake lens and I think it’s the best combo. I don’t see the point in putting a big long lens on such a small body, it would defeat the purpose of using such a small camera. But at least you do have the option to change lenses and use one of the many Samsung lenses available. Some of them are quite fast. The Fuji x100s is, so far, the best camera I’ve ever owned. I love the quality of its fixed 23mm (35mm equiv) lens, the quality of the images is excellent, its low light capability is amazing and you can’t beat its cool retro look. As a street photographer, the silent mode is priceless! I don’t think it is a camera for everyone. The limitations of not being able to change lenses can be very intimidating for many who are transitioning into the mirror-less systems. I find those limitations refreshing and liberating. The camera becomes an extension of my vision and doesn’t get in the way. The Samsung NX300 would be a perfect first step into the mirror-less world. I can also see it being a great companion to a DSLR kit for anyone who is wanting to have a great little camera with them all the time without sacrificing on the quality, like you would with a camera phone. Whereas, in my opinion, the Fuji is definitely a primary camera, one that will make you want to give up your DSLR altogether! A: "Thank you for your kind words Kathy, I hope you join my Paris workshop some day! I am quite familiar with the 35mm and the 24-70mm lenses. My Canon 24-70mm f/2.8 has been my bread and butter lens for years. I used to travel with it but it's heavy and bulky and I've been leaving it behind, along with the DSLR for months now. It's a great lens. I almost exclusively use prime lenses these days and 35mm is the perfect lens for me. It's ideal for street photography (my Fuji x100s has a fixed 23mm lens which is the equivalent to a 35mm). I also travelled for several weeks with that focal length only and loved every minute of it (see images on blog post). The 35mm lens will be a great choice in low light and a great exercise in creativity as it will make you work harder at your composition skills. Another lens to consider would be a 50mm f/1.8, it's a great little lens and a good way to get used to working with a fixed focal length rather inexpensively. Keep in mind too that 1.4 will let a lot more light than 2.8 (four times more light if i'm not mistaken) and will be your best choice to shoot hand held in low light situations. I hope this helps! Thanks for submitting a question for the blog!" A: "Hi Jonty! Nice to hear from you. Since I rarely shoot landscapes or nature photography I don't have much use for a neutral density filter. For those who are not familiar with ND filters, they are a grey piece of glass that fits in front of your lens and reduces the amount of light that hits the sensor of your camera. ND filters are typically 3 stops in strength, some go as far as 10 stops! By slowing the shutter speed, ND filters will allow you to capture motion in water, clouds or any moving subject in daylight with a creamy or blurry look instead of freezing the action. With the use of an ND filter you can set the shutter speed and aperture you want, without having the actual light conditions dictate the settings. In street photography, the use of an ND filter can be useful in order to add motion blur to a street scene for example. My new Fuji X100s is equipped with a 3 stop ND filter in camera which I use to reduce the amount of light hitting the sensor when I shoot wide open in bright daylight. ND fllters are expensive and come in two forms: screw-in or slot-in. The screw-in filters are small, light and easy to fit on the lens. The drawback is that you need one for each lens diameter you own and stacking them can cause vignetting problems. The advantage of the slot-in filters is that they are also stackable and you can adapt them to different lens sizes by using an inexpensive adaptor ring for each lens you own. I hope my answer is useful and helps shed some light on ND filters." Please help me spread the word about this new blog. I helps if you leave a comment below, I would love to hear from you! A: "Thanks Sahil! Sounds like you've outgrown your point and shoot and you are ready for something a bit more challenging. That's the best reason to upgrade, good for you! So many photographers upgrade because of gear lust when they don't even make full use of their current camera. First, do you really want to go with a DSLR? Just because the camera looks 'professional' doesn't mean it's going to be the best fit for you. I would certainly look into a mirroless system before making the decision. Smaller cameras are now coming out with some amazing sensors. If you do buy a DSLR, you're better off buying the camera body only and the lenses separately. Kit lenses are usually not that great and glass is what's going to make the biggest difference. Good lenses for DSLRs are super expensive, keep that in mind too. If you are stepping up your game you will probably start shooting RAW. I would definitely invest into a really good processing software such as Lightroom 5. You can't beat the value of LR ad it's all you'll need. It's a bit overwhelming at first but learn it step by step with some online tutorials. You will soon be able to give your images some pop with just a few slider actions. It will make a huge difference if you haven't used any image processing software in the past. So, to answer your question: YES, post processing is very important but it doesn't mean that you need to spend much time doing it. I never spend more than a minute on an image. Just remember, post processing will not turn a bad picture into a good one. But it will make a good picture even better! Remember the famous quote by David DuChemin: "Gear is good, visions better!" Good luck with the upgrade Sahil!" Please leave a comment below, I would love to hear from you! A:"Hi Richard! Thank you for your kind words and for submitting a question to the blog. I hope my answer comes before you give your presentation. If not, I apologize for the delay! I used to shoot street photography with a DSLR camera, mostly with a 50mm lens, and more recently with the 40mm pancake lens. True, there are a few images on my website that were shot with my 24-70mm lens. That's one of my favorite 'all around' lenses. Now that I've experienced shooting with the Fuji x100s and its fixed 23mm (35mm equiv.) lens for a few months, I can't imagine taking anything else on the streets with me. It's the ideal tool for street photography. In my opinion, street photography needs to be experienced up close and one should not hide behind a long zoom lens. That is not always easy, especially when you start out, as it is often very intimidating to photograph a candid situation when your subject is within arm's reach. The look and feel of the images will be very different and being close is what makes street photography so special and unique. Why do I favor the Fuji x100s for street photography? It's small, inconspicuous and who can resist it's retro rangefinder look? I also love the fact that is has a fixed lens that is not interchangeable. It's simple without sacrificing on the incredible quality of the glass. It doesn't get in the way between me and my vision. It's more of an extension of me than a DSLR has ever been. I hope this answers your question and I look forward to your feedback!" Please leave a comment below, I would love to hear about your own experience shooting street photography. Q: "Hello Valerie, I see that you are a frequent traveller to France, and your photos are beautiful! Thus you seem like the perfect person to ask my question. We are leaving for Paris next week, and I'm wondering what lens you would suggest as an all-around to go with my Nikon d90? I have a 28-200mm 3.5-5.6, 50mm 1.8 and a 35-105mm 3.5-4.5. I love street photography, but also would like to try some interesting Eiffel Tower shots, etc. Merci!" Dianna M.
A: "Another great question, and one that I get asked often! Many would answer that the travel lens of choice, in the selection that you gave me above, is the 28-200mm. It is true that it will give you the range you need to shoot pretty much anything during your travels. 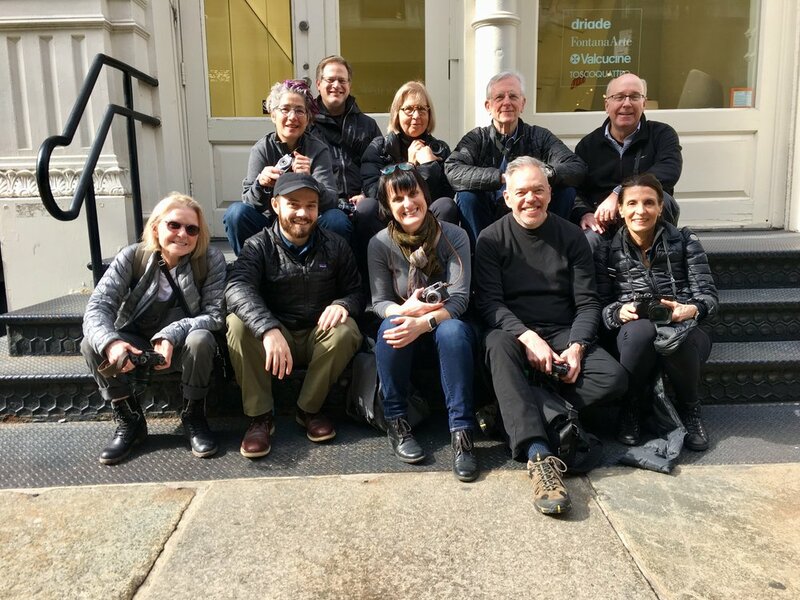 Many of my photo workshop participants choose to travel with a similar lens so that they don't need to change lenses during the photo walks. Depending on how long you are staying, this may be the lens of choice. If you have a few days, I would highly recommend walking for a day or two with the 50mm only. I give that advice to my students and, when they do, they often shoot their best images on those days. Limiting yourself to a fixed focal length lens will make you think more, it will slow you down and you will take better care at composing, you will also be more creative in your framing. 50mm is also a great choice for street photography. A faster lens will also allow you to photograph indoors without a tripod and it will serve as a great food photography lens when you eat at those wonderful Parisian Bistros. Your back will also thank you for traveling lighter for part of your trip. I hope this helps. Bon voyage!" If you have a question, please use the contact form to send it. 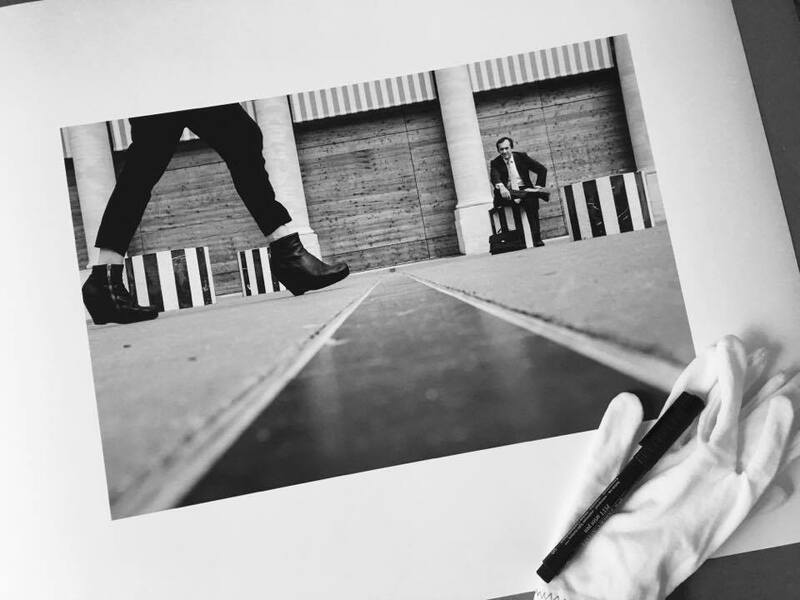 A: I do not print my own images but I also do appreciate holding a big beautiful print in my hands. When I need high quality prints in color or B&W for myself, an exhibit or to sell a fine art print, I use White House Custom Color (WHCC) here in the US. I had the chance to visit one of their labs and was really impressed. The quality is amazing, service is very prompt (printing and shipping usually done within a day if the order is sent in the morning) and the prices are hard to beat. You can get free test prints done to try them out, they will also send you paper samples. Also the packaging is the best I've ever seen in the photo print industry. Your images will always arrive in perfect shape. Even better, two-day shipping within the US is usually free. The lab will also ship all over the world. If you want to print your own work, I would recommend a book by my friend and fellow photographer Martin Bailey: Making The Print or the newly released book by Jeff Schewe The Digital Print Jeff's book will take you step by step through the process of preparing your color or B&W images in LR or PS for printing. If you have a photography related question, please use the contact form to send it. It can be a general question about photography, about the business side of it, etc. I look forward to hearing from you, thanks!